Welcome to the daily journal of my horse and wagon journey into small town and rural America; a nearly forgotten place that’s half boarded-up, a place left behind in the march to a bigger and better world, a place where children are safe to play, where folks wave at one another, where people aren’t judged by the car they drive (shiny and new, or old and clunky), where people don’t rush by if you collapse but rush to help you, a place called the “heartland,” where love and loyalty outweighs power and money. Note: This journey was originally recorded in Facebook, and there were many comments and photos added by the people I met along the trail. Those comments and photos are not shown here, but may be found on my Facebook page (a link is provided in this website). 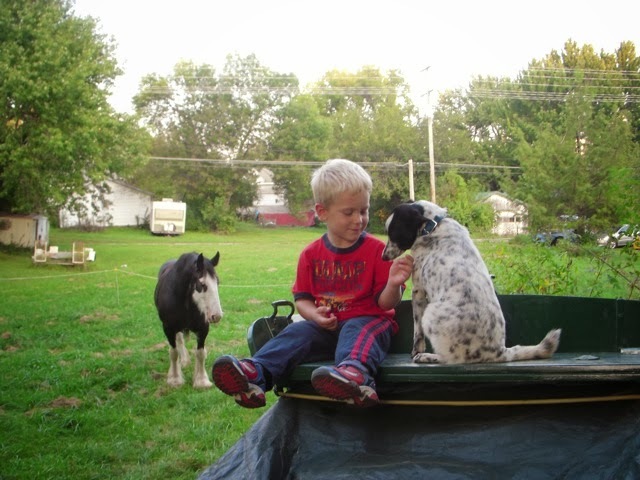 Underway with my Clydesdale horse Reba and dog Jill, a Blue Healer & Rat Terrier mix. Late in the day, we were parked in the ditch, and while giving Reba a bucket of water, I felt worried because we had no place to rest for the night. The road to this first day had been long, I had left behind much of what the world said I could not live without, and it had left me a little jaded. Like the barbwire that hemmed me on the road, my faith was hemmed in doubt. I nearly felt a fool when, in the midst of my worrying, a young lady named Renee stopped to ask if I was alright. Without hesitation, Renee pointed across the way to where her husband Ben worked in a farmyard. Renee told me to go and speak with Ben, and he would put me up for the night. Photo on right shows my campsite (click on photos to enlarge). At dusk (after I had my camp setup) Ben and Renee came to visit. 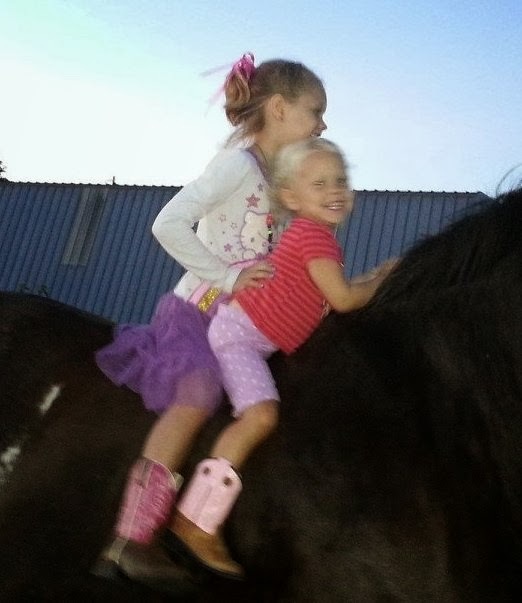 Renee took a photo (left) of their daughters Brooklyn and Bailey on my horse Reba, and later posted it in Facebook. Ben and Renee didn’t know me, they didn’t know I was coming, and still they came forward and gave me a place to rest. From beginning to end (day 1 to 73), folks came forward as proof that rural and small town America remains strong, not strong in a worldly way, but strong in its bond between its people. Our bond is a gift from God, given to the smallest, that we may have peace, harmony, and happiness. There is no greater gift to build on, not to build on what the world values, but to build on what God values. He values us. Early autumn morning on the road to Nortonville, KS (above left). And later, nearing town and looking for a place to camp; I saw a Jeep pull into the empty parking lot of a church, so I drove my wagon in there, tied Reba to a light pole, and spoke with Bob the church pastor. In no time at all, I was given a place to camp on church grounds. Then, as our conversation continued, I mentioned the couple who put me up the night before, and low-and-behold, Bob was their pastor! What is the “chance” of that with dozens of churches around? I believe both very slim, and very good! 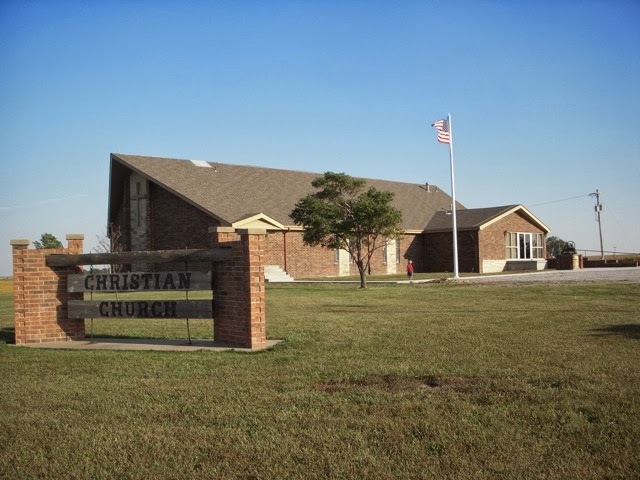 Later in my journey, I e-mailed Bob and asked him to send a photo of the church. Above right is photo. Thank you Bob, for all your kindness! I was both exhausted and needing to get lots of work done; so Bob (and God) put me in a semi-secluded spot behind the church on the edge of town. I set up camp and took care of my horse. I cooked, cleaned, and made repairs. My new water cooler leaked (last year my food cooler seeped and rotted my wagon floor, which I had to replace before setting out this year), so I emptied the wagon and dried it. The water cooler leaked because of the bumping and jostling (so it seems meant-to-be that I gave it to the church). Also, I discovered a short-circuit in my wagon’s electrical system, which I repaired. And I had to repair my tent zipper which had derailed that morning. As I worked, I felt exhaustion-sickness in my gut, but I got everything done, was in bed in good time, and my exhaustion sickness went away. Everything worked out like it had been perfectly planned except I had no plan, and this isn’t about me anyway, I’m just the story teller. I figured that, in the morning, I could roll into town and speak with folks like the Lord wanted me to. Reba would draw them in (she was the star), and the wagon would draw them also because, along with Reba, it made a symbol of shared heritage, an automatic connection to our past, a part of who we are, where we come from, and what we are made of. I changed my plans after praying and ate breakfast in camp instead of town. I then spoke with pastor Bob and his wife and in the course of our conversation; I got an idea (which I would use later while introducing myself in town). I was relieved to see Reba sleep all morning while I did chores because she’d had a restless night and this should have been a rest day for her. I hoped she would get more sleep while I did business in town. We rolled into Nortonville at approx. 11:15. The residential area was dead quiet, the sky was overcast like it would rain, and I wondered if I’d done the right thing by waiting. The town looked very nice with well kept homes like people cared. I passed a daycare and the children waved from the front porch. Arriving downtown about 11:30, I tied-off on the main drag and, because it was the lunch hour, everywhere I turned there was someone to meet and speak with. I went all around the downtown, too many names to remember, good folks, truly, not a sour face in the group. I wasn’t yet thinking about it or I would have gotten pictures of folks (the photo of park above is from pastor Bob). As I went around, I introduced myself by telling how my great grandfather, grandfather, and father all sold farm equipment and did a little farming on the side. I then told my message which is this: Our little towns and farms will continue to dwindle and disappear as long as we follow a godless world that always wants more, more, more. The good news is, we can save what we love. We need only follow the example of our forefathers and mothers who put themselves in God’s hands and, by doing so, built something greater than their ability to imagine. Looking back, it was a little whirlwind of a start in the best sense. I was preaching to the choir but God knew what I needed, and I left town so inspired; I couldn’t help believing that we really can save our little towns and farms. We can survive and, in fact, we can do better than survive; in God’s hands, we can thrive! Photo of 4X4 card I passed out while speaking with folks. And here I want to stress even at the risk of sounding like a broken record; this is not about me. I was stumbling along with a wee little cup of faith, but it was worth an ocean of good in compare to what we get when we put our faith in big government and business. If we can muster the faith to turn away from them; it won’t take God long to show us what He can do. Departing Nortonville (approx. 2:30pm), Reba chomped-at-the-bit to pull the wagon. She’d slept that morning at church, and again while tied to a pole downtown. Now she pulled with purpose on the road to Holton. I helped by getting off the wagon and walking up each hill so she wouldn't have to pull my weight. Still, we were not in shape and we wore ourselves out after going up and down hills for three hours. We kept stopping at farms in hope of a place to camp, but no one was home. I rarely pray for such things but I was so out of shape and tired; I prayed for a place to camp with water over the next hill. Then cresting the hill, I saw nothing. But just then, a truck appeared from the opposite direction. It stopped beside me, whereupon a young man looked out and said, “I hear you might need some water?” His name was Aaron, and he had a tub of water for Reba in the back of his truck (he figured we needed it because he’d heard a man was traveling by horse and wagon on the road to Holton). I was amazed, and I made camp right there on a patch of lush brome grass standing on an elevated flat between road and fence. And I took the photo (above right) there and then, from my campsite. It happened just like that. But I wouldn’t call it a miracle. It was how things can work even with a heart like mine, worrying, which is a sign of little faith. God can do a lot with a little. Reba in early morning mist. She’s a “Black and White Clydesdale” which is a bred. There’s regular Clydesdales like the famous Budweiser Clydesdales, and there are Black and White Clydesdales which are rarer. They are not actually black, but much darker than regular Clydesdales. It's hard playing second fiddle! Jill was bushed. We all were, and we hadn't even got rolling. I worked four hours cooking, cleaning, tending animals, and breaking camp that morning - was wet with sweat by the time we set out. Slow going on this day, very tired, all of us. Hoped to camp early, wasn't worried about making lots of miles. Found a great place, a pond built by the State for fishing. I thanked the Lord because it was perfect. Then I read the sign with its long list of regulations (no horses, no camping, no firearms, no this, no that) and I was ticked off, mostly because I was tired and needed a place to rest, but also because here our little towns and farms have been dwindling for decades and the geniuses in Topeka are building fishing ponds for sissies! Ugh! We got back on the road, parked in the shade of a tree, and napped (deep sleep). Reba napped standing, I napped on the wagon seat, and Jill on the road. Then we were off again, slow as a horse can go, and hoping to camp. And as always, I walked up the hills so Reba wouldn’t have to pull my weight. We came upon this tiny fellow (they had touched noses only a moment before, and I wish I had gotten a picture of it!). A kind farmer named Harold gave us a place to camp for the night and it was perfect. I slept in the barn. Reba grazed in the area shown above and flirted with a handsome gelding across the fence. Harold had an old dog but it went with him up the road, so Jill didn’t have a playmate on this occasion (Jill was living a dog’s dream). couple of teenagers (he's much better looking in real). Chores all done. Time to kick back and have some supper! Yeah baby, I needed this! Spent the day on gravel roads going up and down hills. We camped on a broad grassy shoulder between road and creek, a mile or so from Holton. I had only started to make camp when I lay down to sleep in the old rut of a tractor tire. Reba and Jill slept on either side of me, like right next to me (Reba on the other side of a rope that made up her portable pen). While we slept, a man named Ted passed by on his way home from work. Ted didn’t stop, but returned a few hours later with his grandson Cody. Ted also brought a sack of produce from his garden, and a bag of dog food for Jill. I thanked Ted for his kindness and gave Cody a ride on Reba. I also gave Ted one of my cards and explained what I was about. And because Ted had Hispanic roots, it was only natural that he felt a little uncomfortable. He didn’t say so but, along with his good nature, his discomfort was obvious. I assured him of my belief that we are all God’s children, and I explained that my people had been dwindling for decades and I was only trying to help them survive. Then as now, I am doing my best to deliver a truth that God has shown me. It helps to start with a definition of culture: Culture begins with love and loyalty for one’s people and their way of life. Culture, as God intended it, is human poetry in motion, rich with mannerisms and ways of expression not defined by statements of income, or even by great works of art, but rather by what we hold dear in our hearts. Though love and loyalty, sense of appreciation, and of belonging, a strong cultural bond makes for peace and harmony in small town America, something that big cities, for all their power and wealth, cannot honestly claim. Culture, not as defined by those who look for it in art museums, or in Hollywood movies, or Fifth Avenue adds, but rather, real flesh and blood culture is a gift, from God, given to the smallest, that we may have peace, harmony, and happiness. Unfortunately, those who would install a singular-super-culture that all must bow to, have gutted our children’s God-given right to feel good about where they come from, what they’re made of, and who they are. The void created in these kids is then filled with the values of a system that seeks obscene amounts of power, money, and control. We have allowed ourselves to be undermined. As a result, we are in a landslide cultural collapse; and when the smoke clears, what will remain of the gift that holds us together? As a scout for my people, I have walked through the aftermath of a cultural collapse; broken glass, trash, and angry graffiti in amounts that have to be seen to be believed, with gang activity, vandalism, drugs, and child prostitution in plain sight, in a two-hundred mile stretch of desert; towns with no cultural bond, a mishmash of unhappy peoples, caught in a political warzone between socialist and capitalist forces. This was not the slow decay we all have seen; this was the end result of decay, being collapse. Saving what we love begins with one small step, taken in faith (God is waiting). How do we step? Jesus became the light of the world by being a man of His people, not by being a worldly man. This does not mean we are against other peoples, we are not. In fact, we never get credit for kindness to others among us even though it happens all the time, but let there be some racial incident and our enemies jump at the chance to hate us. We are a humble people (as proven by the way in which we have so quietly dwindled). Our little towns and farms are dying in a world that is too big to see how a life-sustaining bushel of grain is grown in the land of the free. For a golden bushel of grain sprouts not only from good soil and hard work, but from social stability, itself sprouted from the unity of a people bound by love and loyalty. It's a beautiful thing, and it feeds the world. 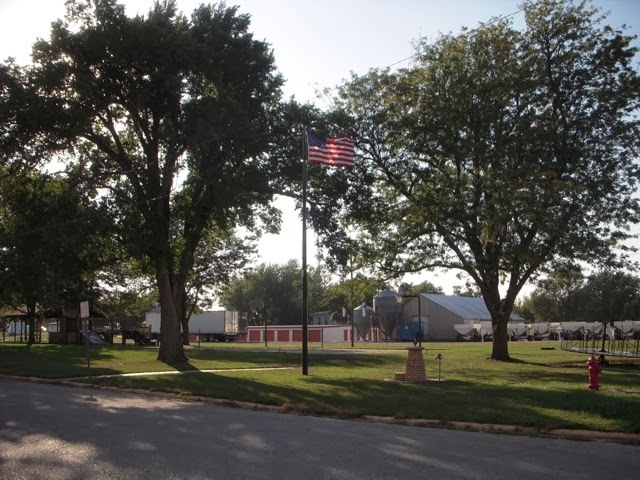 Although a larger community than I was addressing in my mission, Holton is still a friendly little city with a lot of small town folk and flavor (I ain’t just saying that). Folks stopped and got out of their cars to take pictures and visit. In no time at all a man came forward and offered help with anything I needed including a place to stay. A short time later, another man came forward and offered the same. One block NE of town square in Holton KS. One block SE of town square in Holton KS. I had lunch at this dinner; a pork tenderloin sandwich, and man was it good! The owner, Brandee, is pictured on right. It was Friday lunch hour, and for the quality of food, price, plus atmosphere, and the fact that it was next to historic town square; I was surprised not to see more people! I think people were eating at Sonic, Taco Bell, and other fast-food-chains out on the highway by Walmart. We all know what is to be under pressure at lunch, in too big a hurry, perhaps even a little brainwashed by a continual stream of advertisements that tell us what we need, but, if we are to save our little towns; we need to support our locally owned business! Pastor Bob and his wife Danna came from Nortonville and took me to dinner. Then returning to my camp, Bob took this photo of his grandson Carter. My camp was a grassy lot provided by a kind resident of Holton. Neighbors provided basic needs (including fudge brownies!). From Holton we traveled (on gravel roads as usual) towards the town of Emmet, KS. Late in the day, when I stopped and asked Tim and Linda if they knew where I might be able to camp; they gave me an excellent campsite with a fishing pond, row boat, and plenty of grass for Reba. They didn’t know me, didn’t know I was coming, but when I told them I was on a faith-based mission to inspire our people to hang on to their little towns and farms, well, they went all out to set me up in a good situation. Then, as dusk was falling, they returned to my camp with an extra blanket because they knew it was going to get cold and they were afraid I wouldn’t be warm enough. Tim and Linda own a towing service (Reino Tow Service), so they’re not strangers to helping people. I caught a bass and boy-howdy did it taste good! I also had fried potatoes, with slices of green pepper, apple, and oatmeal bread. Funny how when I went fishing in the rowboat, both my dog and horse followed on the shoreline. Then while I cleaned the fish, Reba and Jill stood watching over and under my shoulder. Reba is an extraordinary horse; beautiful, solid, friendly, and highly dependable. God gave her star-power, nearly everyone was smitten and (in a culture where horses are not forgotten) that helped our mission.